Lawrence Sign has been selected to complete ACE Hardware retail signage throughout the region. Lawrence Sign Company is proud to announce it has been selected to complete additional Ace Hardware retail signage projects throughout the region. Nine recent sign installations for Ace retailers solidified the trust essential for the great partnership to flourish. Ace Hardware is the world’s largest hardware cooperative, with more than 4,800 retail stores across the globe. As a cooperative, Ace stores are individually owned by local entrepreneurs who have the ability to make vendor procurement decisions – such as store front signage – independently. 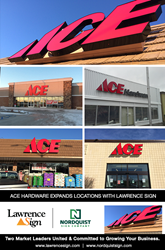 Currently, Lawrence Sign is scheduled to deliver signage for Ace Hardware’s newest retail locations in communities throughout Minnesota and Iowa. Every successful grand opening needs custom signage and Lawrence Sign is ready to satisfy that expectation. Whether Ace Hardware is opening a new store or rebranding an existing location, Lawrence Sign will put into action permitting specialists, survey crews, production experts, and installation teams to fulfill the fast paced timing requirements. “Lawrence Sign’s team specializes in serving multi-site customers like Ace Hardware. We can manage the government affairs process in any municipality, survey the site, and manufacture and install according to schedule. Lawrence Sign makes the signage process worry-free for the customer,” said Robb Walker, CEO of Lawrence Sign. Each Ace Hardware store has exterior custom signage consisting of illuminated channel letters on a raceway displaying the company’s brand. The signage is fabricated using the highest quality material and latest technology to ensure a long lasting product of which Ace Hardware can be proud. Lawrence Sign, founded in 1929, designs, fabricates and installs signs for almost every industry servicing local, national and international clientele. Lawrence Sign utilizes advanced technologies and expansive facilities to provide direct in-house control of the entire sign fabrication process. The Company excels at serving companies with a multi-site national and international presence. Nordquist Sign has been fabricating and installing interior and exterior signage, architectural elements and way-finding signage for more than 100 years. Nordquist’s customer base and scope of work includes custom signage and environmental graphics for hospitals, sports facilities, themed entertainment, corporate/financial and mass transit industries. Nordquist Sign also maintains a gaming division with offices in Las Vegas, NV and St. Paul, MN to serve casino gaming markets throughout the United States. In early 2012, Lawrence Sign combined with Nordquist Sign to unite the unique resources and capabilities of the two companies. Together, Lawrence Sign and Nordquist Sign offer their clients more than 175 years of experience in sign manufacturing and installation for all facets of the signage industry.